The contrast sensor is the most compact sensor available. 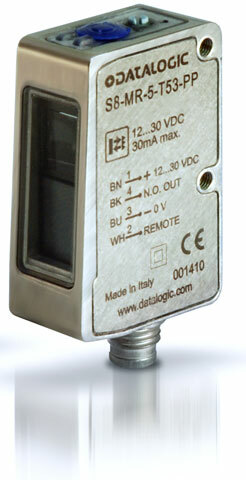 The Datalogic S8 INOX sensors have been designed for frequent wash downs with a corrosion-resistant AISI316L stainless steel case which is IP69K rated. The contrast version is the ideal solution to discriminate fine contrast differences known as print registration marks at very high speeds whilst the clear object polarized retro has been designed to resist typical detection difficulties associated with accurately detecting the position of extremely transparent objects typically seen in the FOOD and BEVERAGE and PHARMACEUTICAL industries. S8-Mr-5-T50-Nh RRX Inox Tra Npn Remote. Priced per unit. 5 week lead time. S8-Mr-5-T50-Ph RRX Inox Tra Pnp Remote. Priced per unit. 2 week lead time. S8-Mr-5-T53-Nn RRX Inox Tra Npn Teach. Priced per unit. 5 week lead time. S8-Mr-5-T53-Pp RRX Inox Tra Pnp Teach. Priced per unit. 2 week lead time.